The economic benefits of SA's push for a global nuclear waste dump took a negative turn during the current parliamentary committee inquiry. Noel Wauchope reports. 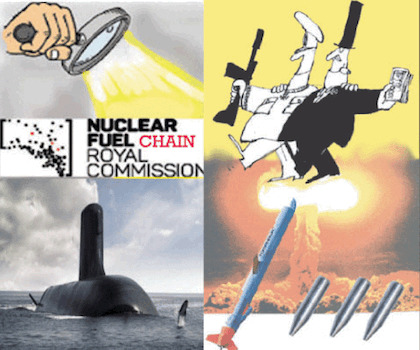 THE SOUTH Australian Parliament is holding a Joint Committee on Findings of the Nuclear Fuel Cycle Royal Commission (NFCRC). The five committee members, with one exception, the Greens Mark Parnell, have pro-nuclear opinions. I thought that it was going to be just a rubber stamp for the NFCRC. Now I am not so sure. The committee gave the NFCRC a grilling on the economics of the plan to develop a nuclear waste import industry in South Australia. Answers indicated that the NFCRC is keen to have discussions with other countries before the matter is resolved at the political level. The committee gave a good hearing to critics of the nuclear waste-importing plan. These witnesses were Keith Thomas, Chief Executive Officer South Australian Native Title Services, Craig Wilkins, Chief Executive, Conservation Council SA and David Noonan, independent environmental campaigner. Opinions on Aboriginal concerns, safety, environmental issues and social consent were considered. Trawling through the 173 pages transcript of hearings of this committee, I was surprised at the rigour of the questioning of witnesses by the politicians. They did ask hard questions about the arrangements for contracts from overseas countries, customers sending radioactive wastes to South Australia. They asked questions about who pays and when, and for what aspects of the process. If it's not going to make money, why do it? Above chart represents 50 submissions opposing nuclear waste import compared with 5 in agreement. There are some people who think it may be that the Chinese will encourage the Taiwanese to send it to China. We don't know. We recognised that, once waste got to South Australia, it was very unlikely to leave South Australia. It was very unlikely that there would be anywhere else you could move it on to, so the liability and the responsibility for that waste would be transferred to South Australia. What was a realistic value of that willingness to pay number? We looked at that in a number of different ways because there is no market for it. Can I assume from this, then, that the contractual agreements with the international partners — the customers, essentially — all happen before year one? the risk of actually obtaining commitment, or not, from countries — have you got a comment on that? When would you suggest that we need to be having those conversations — at what point? Before you sign those contracts in year 6, you have to be very secure. ...We could have a scenario where a super Fukushima, for want of a better description—and please don't quote me in those words—but a very significant action has occurred and nuclear power is stopped globally.......so what you need to do is have contracts for waste which already exists and have those contracts signed up before you make that decision. Then, you are protected against any downside in the nuclear power industry. You have to assume that your lawyers are experienced and you've actually signed up a contract that is enforceable. I think the big concern for me would be the construction cost of the facility. But the critical point is the first shipment and your first bunch of contracts because everything hinges on that. Essentially, the project will become a success or a failure based on that first 15,000 tonnes. Exactly, and if you don't get that 15,000 tonnes plus whatever margin you think is appropriate at the time, that's when, I'm afraid, you write off your investment. Which at that point is a disaster. Yes. It isn't a risk-free process to go into this. There is a very significant risk. What we can identify from the Finland experience is that you need a very long time. We've made an assumption that you can get the facility up and running around 20 years after this financial investment decision. That's an assumption. ....my question is: if it is a 40-year project, which means 2057 is when you start deep burial of the waste, at what stage, in a 40-year timeline, do you start receiving, as a state, the sums of money up-front? In essence we are spending money up until we start signing the contracts, and at this stage on the 28-year timeline that occurs at year six-ish, but if it's a 40-year timeline and there are delays, then it may well be that you keep spending money and you don't get the precommitments until later than year six. : I am not an economist; I am a chemist. Quite clearly, we were not looking at this from an economic perspective. Our remit was to look at it from a financial perspective. The committee members were not the only ones worried about the economic aspects of the NFCRC's recommendations. Despite the short period allowed for submissions, 55 submissions were received. Five of these supported the plan, while 50 opposed it. Some comprehensive and detailed submissions included a critique of their economics, e.g; from Dr. Mark Diesendorf, Mothers For a Sustainable South Australia, Carol Phillips and leading environmental organisations. Who is talking about “Brand South Australia”? China is our largest trading partner. At present, Australia has clear marketing opportunities in China, and for our other nearer neighbours. In assessing the so called golden coin to be gained for bringing in radioactive trash, South Australia needs to also consider the other side of that coin — the economic opportunities that could be lost, along with the risk of a poor or no return on the waste facility investment.